Balloon Shaped Pierced Metal Hanging Lamp With Floral Design, Color- black and golden Create an instant conversation piece by hanging this industrial pendant light in any room of your home. 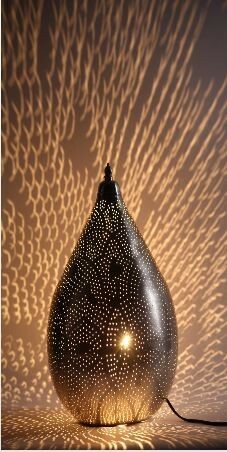 Made of silver perforated iron metal and carefully handcrafted by skilled artisans, each hanging lamp will effortlessly introduce dimension, style and character into any space, big or small. Hang three over a kitchen island or above a dining room table to create a dramatic effect and an abundance of warm, ambient lighting.